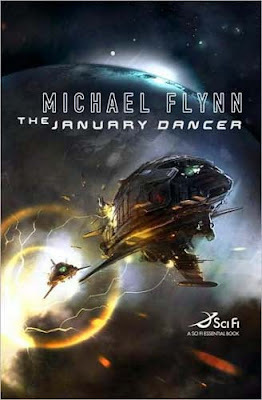 Sort of, but enough to have a Celtic laden idiom for the novel, giving “The January Dancer” a quite archaic feel that complements the far-future setting very nicely. Darwin, Newton, Einstein, and Maxwell are ancient gods of legend since old Earth is no more, or more precisely its original starfaring civilization called The Commonwealth of Stars was overthrown thousands of years ago by the cruel Dao Chettians—The Named Ones—in the Great Cleansing. The cream of the Commonwealth has been exiled across the huge empty volume of space called the Rift, though in time they recreated a vibrant civilization with Celtic overtones, very loosely united in the United League of the Periphery. The original exile planets that are close to the Rift are called the Old Planets and have distinct and quite Vancean civilizations, while the newer more vibrant colonies are nominally led by the Ardry—affectionately known as the Little One—who governs from High Tara using his all-purpose super-agents called Hounds to enforce the law. But space is large so ULP has its share of pirates like the Cynthians, predatory corporations like ICC, local wars, and civil wars. Across the Rift stands the powerful and feared Commonwealth of Central Worlds, though an uneasy truce/cold war is still in existence with spies and intrigue but no shooting so far. The Terrans, as the people that claim descent from Earth are known, live in special ghettoes on the ULP planets and are sort of despised, used as cheap labor and feared as enemy agents since Terra is still under Dao Chettian rule and generally have a more complex relationship with the rest of the ULP society. But they also tend to stick together and help each other as the marginalized groups always did throughout human history. FORMAT/INFO: The ARC copy I have stands at 350 pages divided over sixteen alternating main chapters and eighteen interlude chapters, all with Celtic names. There is a turnover at page 260 where the interlude chapters actually start taking over the story and the novel starts and ends with one such, which accounts for the difference in numbers. The interlude chapters take place in the novel’s present in a bar on Jehovah, a very important interchange planet of ULP where a harper comes to find out and compose a song about the story of the January Dancer which is a famous prehuman artifact. There she finds a mysterious old man called the scarred one who tells her the story claiming he knows it from the surviving protagonists whom he talked with across the years. In the main chapters the story of the Dancer is told through multiple POVs including several Hounds and one Pup—that's a senior apprentice to a Hound—a mysterious Terran, the crew of the unlucky freighter that actually finds the artifact, a rebel leader/planetary manager, and several others. It takes a while to figure out who our main characters are, but slowly they reveal themselves and we get glimpses of their relationship with the harper and the scarred one. The novel is self-contained though there is an obvious sequel dangle with the next book, “Up Jim River”, scheduled for 2009 release. That is another book I will want to read ASAP since “The January Dancer” was so good :) Also included in the book are a list of characters in order of appearance, a time-keeping convention chart, and a star map. October 14, 2008 marks the North American Hardcover publication of “The January Dancer” via Tor Books. Cover art provided by Sparth. Discovered by chance, the January Dancer artifact has the potential to “turn the universe insane”, and when important people realize this, everyone starts wanting it for their own purposes, be it noble or nefarious. But there is much more going on including pirates, civil wars, local wars, and the mysterious disappearances of ships inside the Rift. Slowly a central thread reveals itself and our main characters step up from the pack of the numerous POV characters and take center stage in their unlikely banding together. As one of these characters—Little Hugh O'Carroll aka Ringbao della Costa, planetary manager, rebel leader and all around survivor—puts it, it is as the Fates conspired to bring this unlikely group of people together to investigate several strange events. Speaking of characters, there are so many colorful names like Amos January the freighter captain after which the artifact is named, Handsome Jack Garrity, na Fir Li, Greystroke aka Tol Ben lever, the Molnar khan Matsumo, the Fudir aka Kalim de Morsey, Brigit ban aka Julienne Lady Melisonde, Grimpen, Olafsson Qing and the other Olafsson that mere enumeration should make you want to read the novel. This list by itself conveys something of both the unusual flavor and the intricacy of the book and once you start reading the novel you realize that a lot of these names are not arbitrary. Though it stands at only 350 pages, including the list of characters, “The January Dancer” packs so much inside—action, both space and planetary battles, romance, intrigue, mystery—that you feel you are reading a much larger novel. And indeed, you really need to pay attention to every phrase since you never know when a subtle but quite important plot point will be revealed, sometimes quite offhandedly. When I got to the end of “The January Dancer”, I exhaled that the increasingly building tension had finally been resolved, at least for now, and then I immediately started to reread the book to appreciate its full flavor now that I knew how it ended. And of course I want more so “Up Jim River” can’t get here fast enough! im gonna check it out, but im honestly a little tired of 'WASPs in space' galactic cultures in scifi. Tobias Buckell, Chris Roberson and Thomas Harlan have multicultural space operas out there that have been very well received so far and they may be of interest. im honestly a little tired of 'WASPs in space' galactic cultures in scifi. "Na Fir Li had chosen midnight for his skin and moonlight for his hair." "Another of the tablemates, a woman as thin as a willow branch, mahogany-dark with blue eyes and bright yellow hair, wondered aloud..."
"The market speaks to them. Ah, yes, sahb, this is the True Coriander, known no-but else place! Seven ducat only, and that is that my children go hungry. See, here, come into my stall, when you see ever so fine ’shwari, look good-good on memsahb. Oho, not memsahb? Then, here you find special double-throw silk, made only on J’ovah, think how this feel on her skin…! Hutt! Hutt! No mind his silks. See here my drizzle-jewels, how they sparkle so?" "The dancing girls, as promised, did not stumble much, although considering in how many directions they shook their bodies, it was a marvel that they did not. The Fudir wondered in which cultures of ancient Earth their dance had originated. Most likely, he knew, it was an amalgam of several. During the Dark Age, the songs and legends of the Vraddy, of the Zhõgwó, of the Murkans and others had been blended by folk themselves deliberately commingled. Only the most painstaking scholars could tease the threads apart, and even then not to their certain knowledge. Yet, the dancing was sensuous and rousing, and the sweetmeats and caesodias pleasing to the palate. The dancers wore petal skirts and halter tops, midriffs ill-concealed by sheer taffeta veils – except for the boys, of course, who wore only white cotton sirwals. The Fudir found his pulse quickening to the rock beat, the tinkling zills, and the undulating bodies of the dancers, so different from the syncopated and coordinated vradanadyam on Jehovah."